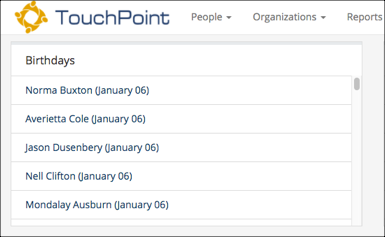 On the left side of your TouchPoint Home Page is the Birthdays section / box. We include the Birthday List as an aid to make it easier for you to minister and stay in touch with individuals. The list will display the names and dates of birth (month and day) of anyone in your ‘birthday list’ that has an upcoming birthday. The names are all active links providing you quick access to that person’s record so you could send an email or make a call to them wishing them a happy birthday. The limit is 100 rows, so if you use TrackBirthdays Search be sure your results will not be more than 100. Of course, it is updated daily, so those whose birthdays have passed will drop off and others will display. If you want to keep up with birthdays for more than just a few people, you might want to consider using Search Builder, so you can send emails right from the Toolbar. You can use the Condition Birthday and enter 2 digits for just the month to find everyone in that month. The 3 ways to populate this list are below. You should decide on one option that best fits your needs. Do not have both the TrackBirthdays Tag populated and and a TrackBirthdays saved search. See the section below with more information regarding these. To use the default, you do not need to do anything. You just need to be enrolled in a Main Fellowship type of org. The default will display everyone enrolled in your Main Fellowship class. That would be something such as a Sunday School class, Life Group, Small Group… whatever class you are enrolled in that is designated as a Main Fellowship organization. The list will be those with a birthday coming up in the next 15 days. If you are not seeing the names that you think should appear in that list, the first thing to do is to look at your own Involvement tab. Then look at the organizations themselves to see which one is flagged as a Main Fellowship class. Ideally, you will be enrolled in only one class that is a Main Fellowship class. Be sure to read more about how the Main Fellowship designation is intended to be used in TouchPoint. If you add people to the existing tag named TrackBirthdays only those individuals will display in the list starting 15 days from their birthday. Go to People > Tags and select TrackBirthdays from the Active Tag drop down list. This will set TackBirthdays as your active tag. You can now add people to this tag either individually or as a group. Tags are not dynamic. So, you will have to add or remove people as needed. If you use the Birthdays Default mentioned above (those in your Main Fellowship class), people are added and removed dynamically because this is based on enrollment. If you use the TrackBirthdays Search (see below), it will also populate dynamically. Whereas the TrackBirthdays Tag is static (it does not get updated unless you update it manually), a TrackBirthdays saved search will use the results of that search each day to populate your birthday list. Go to Search > Search Builder > New Search . Select the condition Days till Birthday and enter the number of days you want to look forward. Because this is updating daily, you might just want to look one or two days ahead. It is your choice. Add any other conditions to find the group you want to track. Select Save As and name the search TrackBirthdays. Be sure you do not put a space in the name. If you have organizations for your staff, you may want to add the Condition Is Member Of and select the staff organization(s). As staff come and go, your birthday list will constantly be updated and contain those people still in the search results. Or, you can select those enrolled in, or are just the leaders of, the specific Program and Division that is part of your ministry. If you decide to populate your own TrackBirthdays Tag or create your own TrackBirthdays Search, your Main Fellowship class will not automatically be included. If you want them in your Birthday list, you need to add them to the TrackBirthdays Tag or make sure they are included in the TrackBirthdays Search results. If there is no one in your TrackBirthdays Tag, or if you have not saved a TrackBirthdays Search, the system by default will display birthdays for your Main Fellowship class. The TrackBirthdays Tag will already exist in your database. If you add people to that Tag it will take precedence over the default (your Main Fellowship Class) and over a saved search named TrackBirthdays. So, if you want to use the TrackBirthdays search or the default be sure to empty the TrackBirthdays Tag.